by Maggie Ganley–Morningside hosted its 12th annual Into the Streets on October 3rd with nearly 900 participants. Omicron Delta Kappa (ODK), an honor society on campus, is in charge of running the event each year. 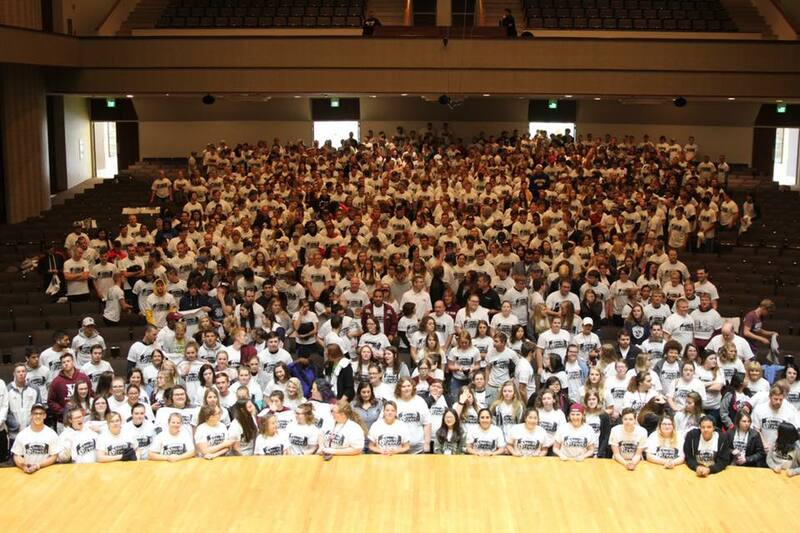 This year’s event was unique for three reasons: it was the largest Into the Streets event to date, it was the first time Morningside alumni have been invited to participate, and it was the first time ODK has partnered with Volunteer Siouxland. Partnering with alumni was an exciting addition to this year’s event and is something Co-VPs, Nic Madsen and Madison Dotzler, accomplished with the help of Stacie Hays, Shiran Nathaniel, and Alex Watters. Shiran Nathaniel, director of Alumni Relations, believes that inviting alumni along is beneficial for both alumni and students. For some alumni, this year’s Into the Streets was a first time experience. For others, they were excited to come back and relive something they enjoyed doing as a student. Having alumni participate also helps students to see a new side of Morningside graduates. “Getting alumni to come and do Into the Streets and volunteer alongside students I think is great. Not just from the standpoint of representing an organization like Morningside, but also to give students an opportunity to interact with alumni in a different setting. It’s not a stiff business setting kind of a deal, it’s more working alongside them so you get to know them differently,” Shiran said. Although both Madison and Nic stayed on top of their tasks as Co-VPs and started work on Into the Streets in May, there were still inevitable hiccups along the way. As many people involved with the planning of Into the Streets can attest, getting in contact with businesses was one of the big hurdles of this event. Many of the contact people for these organizations had changed and getting in touch with the correct people could be a struggle. Partnering with Volunteer Siouxland, who can help add organizations and keep current organizations up to date, will help with this in the future. There were also some organizations that backed out a few days before the event or turned students away the day of because they were ill prepared. There’s also the hubbub of students leaving to go “Into the Streets” in the morning and students getting lost along the way due to confusion. However, Leslie Werden, the ODK faculty member, explained that all of this is to be expected of an event this large. “There’s always something that goes slightly wonky, like getting lost or groups showing up a little late and somebody panicking, but I don’t know that there’s much you can do about that; it’s so many people going so many different places. Something’s bound to happen that’s a little odd, but it always gets worked out,” Leslie explained. All in all, the event was a success. This is partially due to the fact that “being involved in the community really creates an experience for students,” as Nic Madsen explained. This is true for many students and it seems that many left Into the Streets with individual perspectives on what this event meant to them. Abby Koch, one of the ODK members who helped plan the event, believes Into the Streets helps all students feel involved. “Into the Streets is basically the biggest event on campus. It’s also a good way for me, being a commuter, to be involved on campus,” Abby said. Dylan Ferguson, a senior, helped out at the Sioux City Public Library for the day and enjoys being able to give back to a community that does so much for students. “It was kind of boring work, I will admit that, but it felt good doing it because I know that it could take some of the weight off of the shoulders of the other staff there,” Dylan said. Long time Into the Streets volunteer, Kaitlynn McShane, helped the Salvation Army this year. She believes that having a day full of volunteering can show students all of the volunteering opportunities that are available to them if they ever want to get involved outside of Into the Streets. Madison Dotzler hopes that this day will get students to volunteer more in the future. “To me, Into the Streets means connecting students with local organizations and encouraging them to make volunteering a part of their regular, every-day life. Trying to create a pattern of volunteering and giving Morningside students a connection with business and organization leaders throughout Siouxland,” Madison said. By sending out a survey to students asking for feedback, ODK hopes to make this event even bigger and better next year and in the many years to come.